One of the best things that happened to me in life is learning to read Japanese. The Japanese have a talent of writing meticulous instructions whatever the topic is: travel guides, cooking recipes, etc. In this case I want to say Thank You to Japanese sewing and crafts books. On a recently trip to Tokyo to visit friends I finally picked up a sewing book I’ve been thinking for a while but was too timid to try – The Book of Men’s Shirts by Shimazaki Ryuichiro. What makes this book a treasure is – 1. Every single shirt is something I would love to have my husband wear. 2. 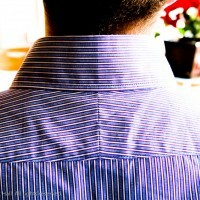 The instructions are painstaking and there’s no guesswork even for someone new to menswear. My husband went on a week long mission trip to Ukraine last December and I dedicated the week alone at home to “project secret” – a shirt as his Christmas present. 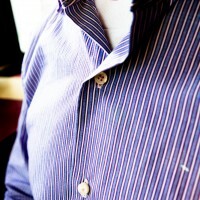 We picked the fabric together during a trip to Shanghai at the huge textile market there. 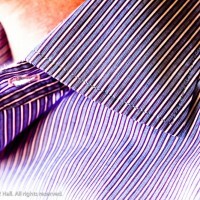 It’s a lovely blue-purple-white striped cotton shirting. I used the pattern No. 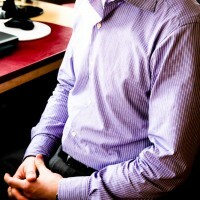 4 – Semi widespread collar shirt, with a small variation on the sleeve to replace the gathers with more traditional pleats. I chose smaller than usual 9mm chunky 4-hole buttons with pink button holes for a little character. Size medium fits my hubby like a dream but these patterns do run much smaller than standard US/European sizes so make sure you read the measurements first.